Dear fellow cat-lover,thank you so much for responding and showing me that I really did do right for my cat considering all the sad sorry lives he could have ended up with. Gotta love those cats. They are really remarkable animals. Please give yours a chin-rub from me. Cheers! Thank you, June. Yes, sunshine after the rain, new life after loss. I’m trying to focus. Most days I can do this. Thanks for checking in and responding.You sound like you’ve been through some tough times yourself. Cheers to you. Compelling title or not I felt that way that night and when I woke up the next morning. I know I did it out of compassion and caring. But OMG “pulling the plug” happens too often and never comes easily. I feel better this week, thanks. Cheers, Elaine. Beautiful, poignant, that holding of love and grief. So many of us have suffered through this. I remember the vet’s last house call with Daisy–how hard for me and how ready she was to go. Thanks, Robin. Thanks, Elaine. Yeah, strange how these sweet creatures mark different chapters in our lives and stories. There’s always their side of the story which seldom gets told. How great that you could recognize that Daisy was ready to go. Hi Robin. I am so glad we met this weekend, it is an honour. I had to “put” our dog Tara down October 2010. Seven months later Kyle was taken off life support. I know they are together, running freely, happy. It is us left behind who grieve, long for, miss them. We do the impossible out of love. Love that doesn’t die, that grows stronger with every passing day. You did the right thing. Your blog is excellent, I can’t stop reading. I’m telling everyone about your blog. I HOPE WE CAN MEET UP AGAIN, FIVE HOURS ISN’T THAT FAR! Carole, it was so great to meet you. Thank you for all your encouragement. I love, “We do the impossible out of love.” I’m sorry for the circumstances that brought us together but I’m so grateful for finding you. I’m hoping to do the retreat in May. It will take place during my daughter’s birthday but maybe that is exactly where I should be then. Five hours is pretty close. Cheers to you. More times than I like to recall I’ve been there holding my dog as he took his last breath. Even my very first dog that I got as a teen was assisted off this life and I refused to let them take him to do the deed. That was 25 years ago and I just wanted him to know I was there and it would be ok and it was. The most recent was last May and Al had cancer and hadn’t been in pain but couldn’t go to the bathroom. It was time. I adopted his successor two weeks later and gave another dog a chance at life. I highly recommend it. Willie isn’t Al, but because of Al and I he gets to have a good life. Take home another kitten. Pick up your routines and remember Skittles by continuing to love. Oh Angela, your words – thank you so much. Yes, “to know I was there and it would be ok” is what I felt, maybe what everyone feels when they are faced with putting down a life they love. I will keep loving. Cheers to you. I, too, cried reading this, thinking of your loss of Skittles and its resonance with the loss of Marika. It’s a testament to your strength and your writing that I’m so moved. And Wendy is right–you gave him, and Marika, a life that had much joy and freedom. I love that you first tell the story from your dog’s perspective–sometimes the innocence of animals is almost unbearable. 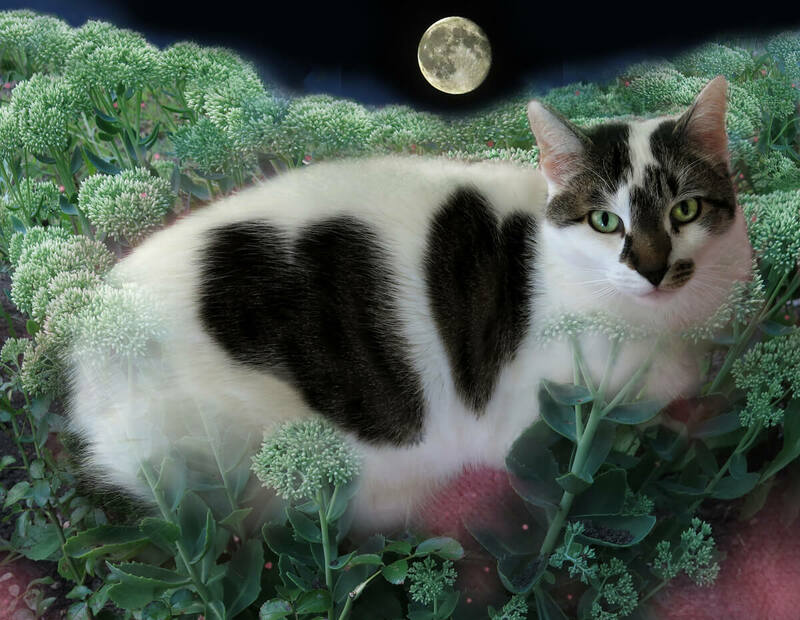 The gorgeous photo of Skittles and his two hearts. The way you convey that our pets are our family and our history is filled with lovely details. And that almost full moon–perfect. This is a beautifully understated expression. Thank you. You continually create beauty and I admire you so much! Oh my gosh, Kirsten. How can I reply to that? Thank you so much. Your words are a real gift to me this morning. And “continually create beauty” is going to become my mantra now. Thank you so much. I admire YOU. Thanks, Jane. Yes, rereading Wendy’s words I am more ready to receive them this week. And I’m breathing better too. It’s good to hear from you. Cheers! Alas, Robin. On several occasions, I have been through the experience of assisting a beloved pet to end its suffering. It is a humane thing to do when one’s life has lost its quality. Time heals the sense of loss and of guilt. Time heals a lot, I’m beginning to notice. I wonder if you keep a list of these sweet creatures in your head as I do. The loss and the guilt grow more vague but I want to hold onto the memories. Thanks Annette. Robin, so sorry you had to go through this, but I believe it was the best choice for Skittles. Adrian wanted to die at the end when there was no quality at all in his life, and I helped arrange the resources for him to do that without pain. I miss him, but I’m not sorry I did this. It’s something we can do for each other. We still grieve though, of course. I’m still learning, Lynne. You’re right. And if I had the chance to go back in time, I’d do it again the same way I think. Yes, we still grieve. Cheers! You did not kill your cat, Robin. You filled a promise. Spoken or unspoken we make a promise to our pets. In exchange for their unconditional love we promise to “have their back”, to care for them the best we know how, and to be there for them when they need us. The decision you made for Skittles was holding up your end of the bargain. You chose to help end his pain and suffering even when you knew that saying good-bye would cause you pain. It was a selfless act not a selfish one. Missing him and feeling the grief of his absence isn’t due to your killing him. As I certainly don’t have to tell you, its due to how much you loved him (and of course because he was your daughter’s cat). I believe this with all my heart. Almost 2 years after having to make this decision for my beloved golden retriever, I am still sitting here with tears rolling down my cheeks as I write this ( and I am not dealing with the additional grief your heart is living with), but I know its indicative of how much I loved my dog, not that I made the wrong choice. Wishing you peace in your decision and joy in remembering the many wonderful moments you and your daughter experienced with Skittles. Thank you for your kind words, Wendy. It does help to remember that I gave him a really fine life. I know I’d be missing him and grieving even if he’d died in his sleep. That’s how it goes when you love someone or something. I just wish I didn’t have to be the source of so many lives snuffed out. Many thanks for “being here.” Cheers!